Photograph from Wright State Men’s Basketball’s Twitter. Wright State Men’s Basketball hosted two teams this past week at the Nutter Center. On Thursday, Feb. 7, the Raiders faced Oakland University and won 76-62. On Saturday, Feb. 9, the Raiders hosted Detroit Mercy and won 83-60. 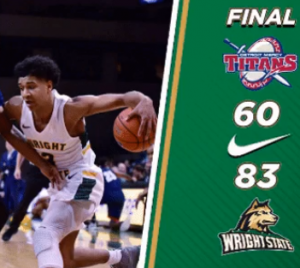 Wright State was able to win this Horizon League game by 14 points despite losing for much of the game. The Raiders were down 41-35 at halftime but were able to come back strong in the second half. The leading scorers for the Raiders included Loudon Love with 18 points, Bill Wampler with 16 points, Malachi Smith and Mark Hughes with 11 points, and Cole Gentry with 10 points. The Raiders avenged their loss to Detroit Mercy earlier in the season by dispatching the Titans with a score of 83-60. The win moves the Raiders to 15-11 overall and 9-4 in Horizon League conference play. Several Raiders scored big, including Loudon Love with 17, Skyelar Potter with 14, Malachi Smith with 14 and Mark Hughes with 12. Overall, the Raiders shot 49 percent in this game. Next up for the Raiders is Northern Kentucky. NKU defeated Wright State last time the teams met 68-64. The game will be at 9 p.m. in the Nutter Center on Friday, Feb. 15. The theme is blackout and starting at 7:30 p.m., Raider Roundup will be taking place in the McLin Gym. Raider Roundup will feature face painting, free food, a live DJ, inflatables, a photo booth, giveaways, raffles and more.